When I first read the book synopsis, I really had no interest in the book at all. A futuristic story telling of the dangers of dependance on digital devices didn't really sound that thrilling to me. But I picked it up because I read a one line review that remarked the whole book to be a treat to word lovers. I figured I'd give it a go. It took me awhile to get into the book, but once it started rolling, I was hooked. The entire book is formatted like a Dictionary, with chapters A-Z (which is fun), including footnotes. And although I thought stopping mid sentence to read the footnote was annoying and disruptive initially, I got used to it quickly and looked forward to the information the footnotes provided. The Word Exchange is written as a history, a retelling of events, from the accounts of Anana Johnson and the journals of Bart (Horace) Tate. The story begins at the North American Dictionary of the English Language, one of the last dictionaries in print, (One of the last ANYTHINGS in print for that matter.) where Anana, Bart and Anana's father, Doug, work. The Dictionary is busy getting ready to print it's third (and probably last) edition, when Doug suddenly goes missing, leaving behind a peculiar set of clues to his location. It quickly becomes apparent that Doug may be in danger, and Anana is determined to find her father, no matter what. The Meme (calling it a glorified smart phone doesn't even cover the half of it) is running everyone's lives. The Meme, a device that is constantly delivering news, hailing cabs, ordering food for you at restaurants, sending texts, answering your calls, looking up words you don't know (for a small fee) on The Word Exchange... anticipating ALL your needs, has become so popular that there are few people left that don't use one. It does all the thinking for you. Doug who has always been anti-Meme, still communicating with hand written letters and by cellphone, has been predicting something called the "word flu" for years. (especially after the incident in Taiwan in 2016) People called him paranoid and crazy. He said that it would be the Memes that would infect them, give them a sickness that had the potential for them to lose language altogether. The story itself is gripping and complex, as readers go on the search for Doug and read the horrors caused by digital dependance. But it's the word craft that left me speechless. That one line review was absolutely correct. Not only was this book a literary treat to lovers of the written word, Graedon treated the writing so beautifully it left you with reverence for the craft. Normally I hate when authors use big words like they are trying to prove something, but I feel like there was a point to them in this story, and it worked. But aside from the story, this book is a warning. We are clamoring for the latest "smart" technologies, texting more than speaking face to face, (our teenagers spelling and vocabulary has suffered because of that)—every time Graedon used a (real) word I didn't know it felt like she was proving that the unbelievable word terrorism happening in her story was in fact in its beginnings right now—that we are on the same trajectory and companies are exploiting it. When the "word flu" hits, the text is littered with made up, nonsense words. Initially, it was interesting, but as characters became deeply infected, the pages and entire sentences that were entirely nonsense got difficult and tiring to read. I wanted to know what was happening. I wanted to know what they were saying, but never found out. That's kind of when it hit me that the real words Graedon used that I didn't know might as well have been nonsense words to me if I didn't take the time to learn them. If you love words and language, I'm telling you, READ this book. I wanted to highlight several passages just for being complete works of art. The story is gripping, the plot is smart and extremely well thought out, and the message is powerful. I was even surprised, with how little readers learn about many of the characters, how attached I became to many of them. All around, an amazing read. 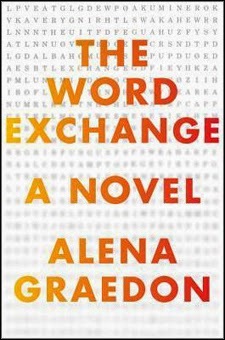 An impressive debut novel for Alena Graedon. "Words, then, are born of worlds. But they also take us places we can't go: Constantinople and Mars, valhalla, the Planet of the Apes. Language comes from what we've seen, touched, loved, lost. And it uses knowable things to give us glimpses of what's not. The Word, after all, is God." "Just as language can be pliant enough to create a word for faces caramelized by firebombing, it's elusive enough to mask them in metaphor." What word would you miss most if it didn't exist anymore? I chose Wassil as the drink for this book because German philosopher, Georg Wilhelm Friedrich Hegel, is referenced and quoted from many times throughout the entire book, and a great deal of the book takes place during the Thanksgiving and Christmas holidays. (there are lots of cold days described) Since Wassil is a traditional German drink, traditionally served in the winter and around the Christmas holiday, I thought it was the perfect selection for this book.